Santiago’s Bodega – 802 Virginia Drive Orlando. We did not set out to review Santiago’s Bodega, but so glad we made the visit. Originally, we had intended to review another restaurant, but after a disastrous experience with a host at that location we determined they did not want our patronage and left to find a more customer focused establishment. As you know we never post negative reviews so this location will be resigned to the back burner. Heading back up Mills Avenue and feeling hungry we decided upon Santiago’s and were immediately seated on a great table on the patio. The restaurant was in full flow with “Brunch”, a cavernous affair with tables laden with Crabs Legs, Prime Rib, Biscuits, Gravy, Pasta, Omelets, the list goes on and on and enough to satisfy any diner. 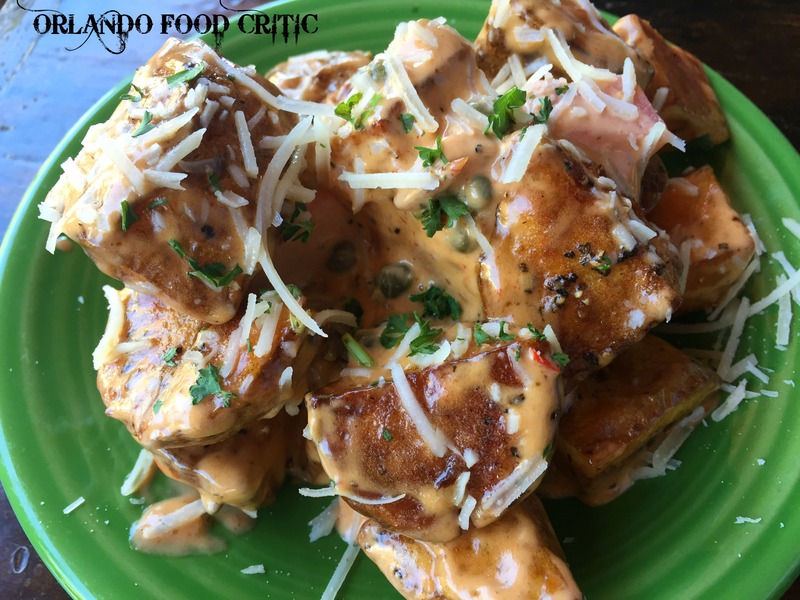 We will return to review the brunch offer as we chose the tapas option that runs in parallel to the brunch menu (a great idea). Our server Shirley made us feel welcome and appreciated right from the start, and with friendly efficiency told us of all our options and made some great recommendations. Genuinely amazing service! PEI Mussels from a specials list – Accompanied by our selection of Sour Dough Bread for dipping, theses delicate mussels were sweet tender and perfectly cooked. 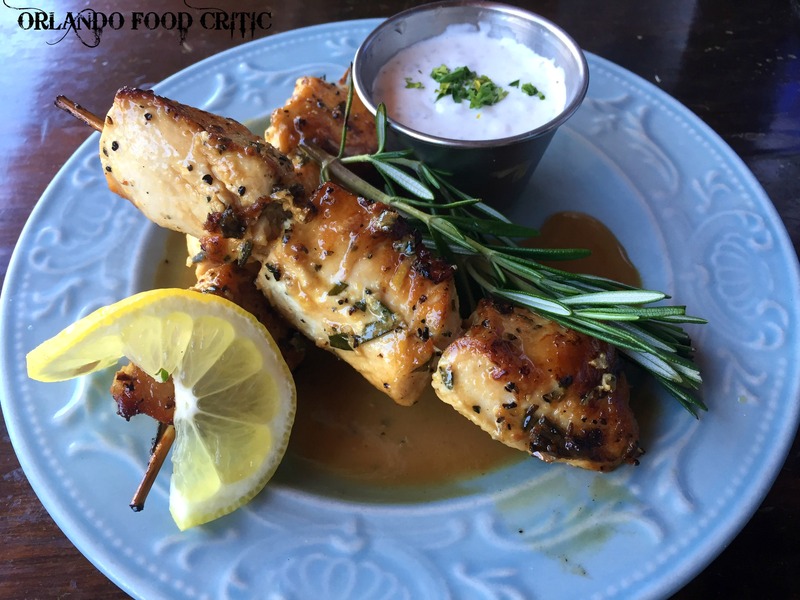 Chicken Skewers – Marinated in Olive Oil, Lemon Zest & Rosemary & served with a Lemon Tarragon Sauce. The Chicken cubes were really tender and were complimented well with the sauce that had just a hint of Tarragon, perfect. So perfect in fact, we ordered another portion of the skewers half way though eating them! Patatas Bravas – Fried potatoes with olives, capers, tomatoes and Parmesan Cheese drizzled with a spicy sauce. I don’t think we have ever had Tapas without ordering these but they vary in quality wildly from Tapas Bar to Tapas Bar, these were excellent. We all have a benchmark for differing types of food and our benchmark for Tapas has to be Salamanca in St Andrews Street, Dublin, so we are pleased to say Santiago’s Bodega matches this benchmark (no mean feat) but is distinctly closer to visit. To sum up, Great Service (Thankyou Shirley) Amazing Tapas and Superb Patio & Dining Options, add this to your dining “Bucket List”. See you for Brunch soon Shirley!